Looking to buy in a quiet area with spectacular views, beautifully kept lawns, bubbling fountains and sparkling ponds? And never hear a word of complaint from your next-door neighbor? 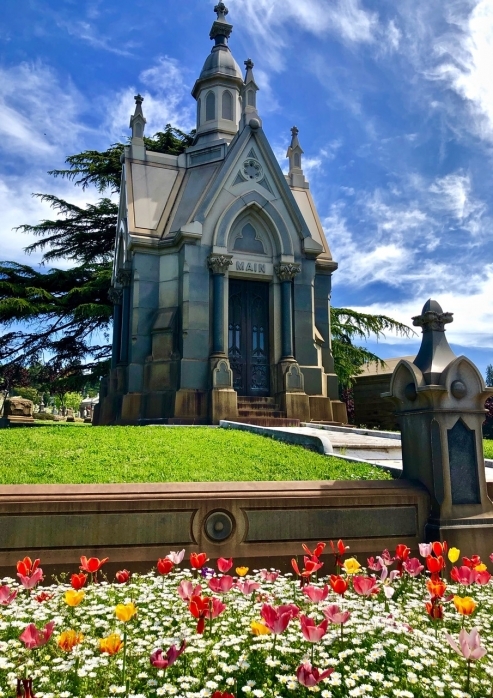 Look no further than Mountain View Cemetery in Oakland. Plots are currently available for $5,000 to $8,000 for a single grave. If money is no object, check out a primo plot where $400,000 will buy you a modest, uninhabited mausoleum. Renowned residents who are already “committed” to the Mountain View community include architects Bernard Maybeck and Julia Morgan, J. A. Folger (the coffee guy) and Domingo Ghirardelli of chocolate fame. For more name-dropping, the cemetery was designed by Frederick Law Olmsted whose landscape designs include Central Park in New York City, the Stanford University Quad, and the grounds of the U.S. Capitol in Washington, D.C. Although it’s privately owned, the cemetery is open to the public. Dog walkers, picnickers, and lovers out for a sunset stroll are frequent visitors. Docent-led tours begin at 10 a.m. on the second and fourth Saturdays of each month and last about two hours. For a private tour, contact Kristie Ly (510) 658-2588. For all tour options, check the website.